A mix of over 400 Pepsi beverage machines and 175 Canteen snack vending machines are distributed throughout the campus. All vending machines accept coins and paper currency; the majority of beverage vending machines and all snack machines also accept Visa, MasterCard, and American Express credit cards; and Gator 1 cards with established vending accounts. More than 400 washers and dryers are located within student residence halls and may be operated with coins; Visa, MasterCard, and American Express credit cards; and Gator 1 cards with established vending accounts. Gator 1 cards with established vending accounts are accepted at the O�Connell Center concession stand. Paper currency-to-coin change machines are located at the Reitz Union. Gator 1 cards with established vending accounts can be used at library copy machines. In addition, the office supply vending machine located at Library West accepts Visa, MasterCard, and American Express credit cards, and Gator 1 cards with established vending accounts. Vending account deposits are accepted in the Gator 1 ID Card Services office in Room G071 of the UF Bookstore & Welcome Center and selected residence hall areas. 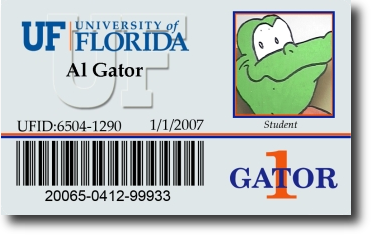 Creating a new account or adding funds to an existing account can be done online at www.gator1.ufl.edu and logging in to your Gatorlink account. Click on "Choose an Option" and choose "Create an Account". A Terms and Conditions screen will appear. After accepting Terms and Conditions, the "Select a Product" page will appear. Check "Vending" and enter the dollar amount you want to put on your card. Scroll to bottom of screen and click "Submit." This will take you to the Payment Screen for a credit card payment to be entered and processed. Please select �Finish� to finalize your transaction.